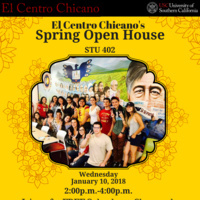 Join us for a great opportunity for new and returning students to meet the Latinx community at USC and find out more about what services El Centro has to offer you, while also connecting you with club/org leaders (everything from academics, politics, gender, outreach, Greeks, networking base groups to also Graduate student club/orgs), faculty/staff/alumni/allies and El Centro staff. Plus, free Salvadoran chessecake, Horchata, and a Latinx Resourse Handbook. We hope you can make it!